And, as it turns out, making granita is about the easiest thing in the world, involving little more than sugar, fruit, and time. You combine puréed fruit with sugar or simple syrup, put it in the freezer, and wait. In fact, the waiting may be the hardest part — I saw Chris reach into the freezer with a spoon at least three times in as many hours to sample the granita as it froze. Like I would do such a thing. 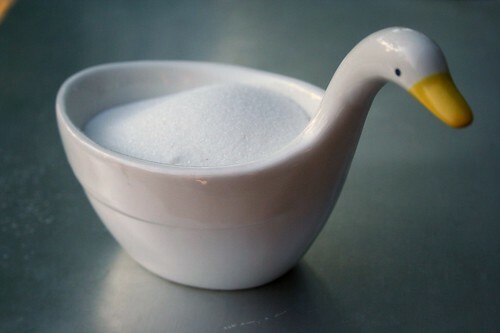 1) Make a simple syrup by bringing the water and sugar to a boil. Stir until the sugar is dissolved, then set aside to cool. 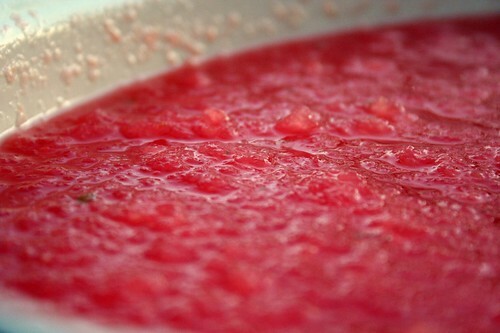 2) Purée the watermelon in a blender or food processor. Add sugar syrup to taste (I used about ½ c.), then stir in the lime juice and zest. 3) Pour the mixture into a shallow glass or ceramic pan (the shallower the pan, the more quickly your granita will freeze). 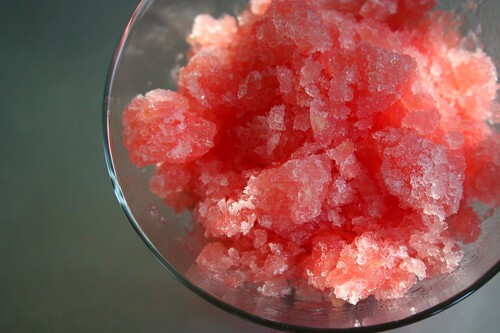 Freeze for 2-4 hours, stirring with a fork or whisk every 30 minutes to break up the crystals, until it reaches the desired consistency. I like it just beyond slushy, so that it remains icy in your dish and melts in your mouth. You can vary this recipe endlessly by substituting 2 cups of juice, coffee, coconut milk, or puréed fruit for the watermelon and swapping out the lime for lemon (or eliminating it entirely). This entry was posted on September 2, 2008 by Megan @ When Harry Met Salad. It was filed under frozen treats and was tagged with granita, watermelon. I was given an ice cream maker by an aunt one Christmas. Unfortunately, it was one of those that required intricate layering of ice and salt, and even when that task was performed perfectly, which was difficult, it still didn’t freeze the ice cream very well. My struggle to make pumpkin ice cream while also dealing with an unfortunate romantic entanglement one Thanksgiving Day became the subject of an autobiographical monologue that I performed while I was an actor in Chicago. The other day I found the publicity still for that show. It was me, dressed in black leather and a vintage embroidered apron with a forlorn ice cream maker lying ruined at my feet. I would scan it and send it to you, Megan, if it weren’t so embarrassing. Why specify a seeded watermelon? Dave – Because I’m bossy like that. 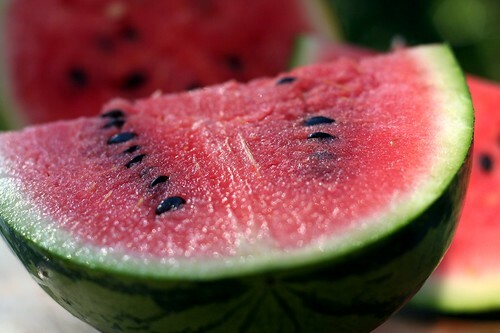 Actually, now that you mention it, I realize that’s a bit ambiguous — some might read “seeded watermelon” as “a watermelon containing seeds” while others might interpret it to mean “a watermelon from which the seeds have been removed,” which is what I meant. I’ve edited the recipe for clarity, although I suppose seed removal should go without saying. omy. 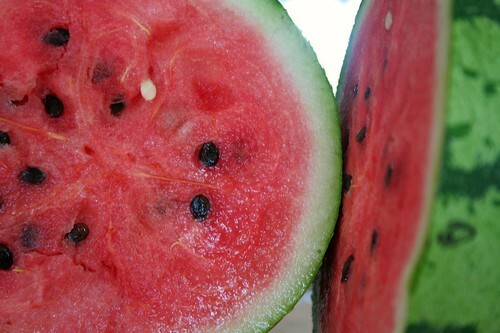 what a PERFECT picture of the watermelon in the last picture! How adorable – your matching watermelon posts! I really dislike everything about watermelon; even the thought of it makes me vaguely ill, and yet I totally want to try this because it looks so damn good. You better get a book deal out of this blog. Sarah – Why, thank you! And thanks for your visit. Lulu – Wouldn’t that be nice? This has none of the semi-gritty texture of watermelon and the sugar intensifies the sweetness while the lime adds a bit of zip. It’s seriously yummy! As I mentioned to Chris, if you had some chickens they would finish that watermelon – I give them the rinds and they are completely gone by the next day. Bubbles read my mind. Add in some vodka for a little kick next time! I was watching Everyday Italian this weekend and that’s exactly what Giada did. I actually considered adding vodka (or even rum) but as this was my first foray into the world of granita, I thought I’d start with the basics. But even if you added alcohol, you’d still want to stir frequently so that you’d end up with ice crystals rather than a big hunk of flavored ice. Looks delicious. Have you tried adding alcohol? The tiki enthusiast in me sees a lot of potential there. The reason I didn’t think you would need to stir is because the alcohol doesn’t freeze. I make what I call “bucket” drinks in the summer that have alcohol and fruit juice concentrates / juices. They stay soft enough to scoop with an ice cream scoop. To serve you add some sparkling water or sprite to the soft frozen mixture and it turns slushy. Okay all you lushes, I made this a second time, adding a bit of vodka (¼ c.) as several of you so bossily demanded, and I was quite pleased with the results. No noticeable difference in taste (because, um, vodka doesn’t taste like anything) but the ice crystals were a little bigger and fluffier (you know, if ice could actually be described as “fluffy”). I still stirred every 30 minutes or so, although I suppose if you wanted to end up with something other than granita you could do away with the stirring.